Experts have recommended the rules governing trials of drugs like the one which left six healthy men seriously ill should be tightened. The group, set up by the Health Secretary, has published an interim report on preventing such events. It said the initial drug dose should be given to just one person - which was not the case in the London trial. And it recommends drugs which affect the immune system may be best given to people who are already ill. The trial of the drug TGN 1412, designed to treat rheumatoid arthritis, leukaemia and multiple sclerosis, was created by the German company TeGenero, which has since filed for insolvency. 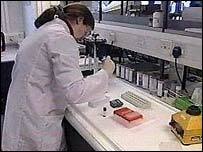 The trial was carried out by Parexel, at its offices at Northwick Park hospital in north London. All six men who were given the drug suffered multiple organ failure. One, Ryan Wilson,20, who was the most seriously affected, still faces the possibility of losing all of his toes and some of his fingers. The Expert Scientific Group, led by Professor Gordon Duff said its recommendations applied to trials involving drugs such as monoclonal antibodies - of which TBN 1412 is one. Antibodies are produced in the body in response to infection. Monoclonal antibodies are made in the lab - and some are already on the market being used safely and effectively. The group's report also called for more dialogue between the drug developer and regulator when dealing with high risk drugs, and better international sharing of data on serious adverse reactions. "Our interim report provides proposals for the future authorisation of trials involving these types of products and to further improve safety. "Clearly the Northwick Park incident has informed the work of the group but this is not a further investigation into the incident. "It is about the wider issue of such clinical trials and about ways to ensure that this type of trial is safe and effective for the future. A drug industry group - made up of the Association of the British Pharmaceutical Industry and the BioIndustry Association - submitted its own recommendations to the expert group. It suggested giving just one subject the active medicine on the first day, and then giving "staggered" increased doses to others so it is possible to closely monitor side effects. Such studies should also be carried out at hospitals with intensive care facilities, they recommended. Auriana Griffiths of Irwin Mitchell, the law firm representing Ryan Wilson and Mohamed Abdelhady - another of the men involved in the trial, said: "I am pleased that the report has set out a number of very sensible and vital recommendations to help protect the safety of participants in clinical drug trials." Dr David Glover, an independent consultant to industry and a member of ABPI/BIA taskforce, said: "The group's report has come up with some sensible recommendations for the future. "In particular it has acknowledged that there are more appropriate methods to set the starting dose for the first trial than was used for TGN1412 , and that if those methods had been used a much lower starting dose would have been used." Health Minister Andy Burnham said a public consultation would take place before the group's final report was published. In an earlier report, the Medicines and Healthcare products Regulatory Agency said Parexel - who deny any wrongdoing - failed to follow proper administrative procedures in carrying out the trial. The MHRA also said the drug was given in the correct doses and there was no sign of contamination or manufacturing errors. But the MHRA, which sanctioned the trial, said the effects on the men were the result of an "unexpected biological effect". It recommended then that a "precautionary approach" should be taken in future trials of drugs like TGN1412.